The deregulation of seed markets in the early 1990s, in principle, ended state-owned monopolies in seed production, marketing, and distribution. In the last decade, significant investments have been made in liberalizing seed sectors in most African countries, resulting in increased participation of private seed enterprises (both multinationals and emerging domestic companies). However, transition towards a vibrant, private sector led seed system has been slow due to weak enabling environments. Enabling business environments are the “set of policies, institutions, support services and other conditions that collectively improve or create a general business setting where businesses activities can start, develop and thrive”. Like any other industry, the seed sector in sub-Sahara African countries requires an enabling environment to thrive. The central objective of TASAI is to promote the creation and maintenance of enabling environments for competitive seed systems serving smallholder farmers. 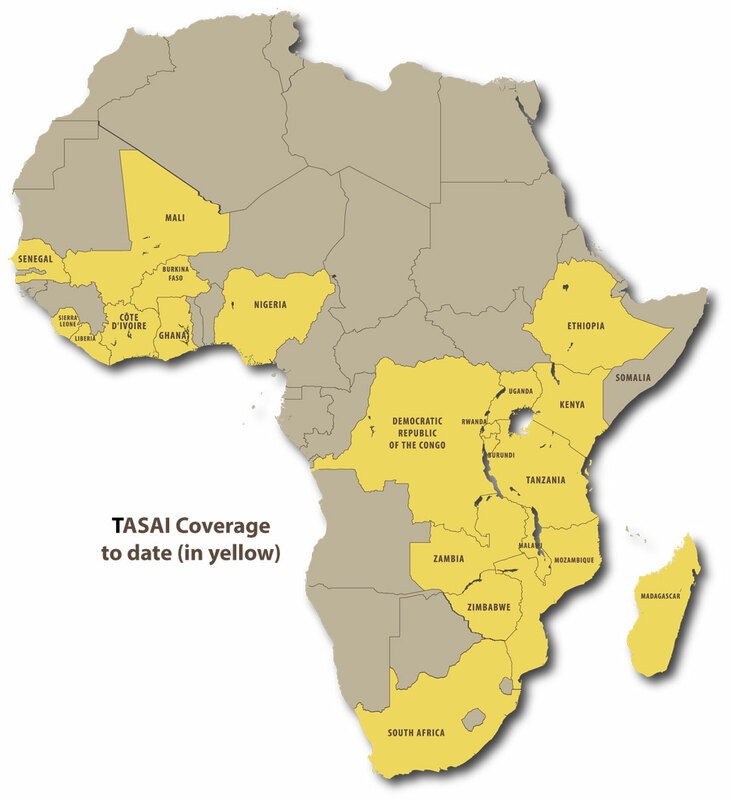 It is this enabling environment that TASAI seeks to measure, track, and compare across African countries. The intended outcome of this index is improved access to locally adapted, affordable, and high-quality seed of improved varieties by smallholder farmers in Sub-Saharan Africa. Seed systems are critical to improving food and nutrition security, resilience, and livelihoods of smallholder farmers. We define success for seed systems based on its ability to deliver the following outcomes for farmers: Availability, Accessibility, Affordability, and Quality. Availability: For a specific crop variety availability entails that all seed classes are available in sufficient quantities to meet existing demand. Further, it requires timely availability of a wide range of varieties that are both agro-ecologically adapted and responsive to farmers’ needs. 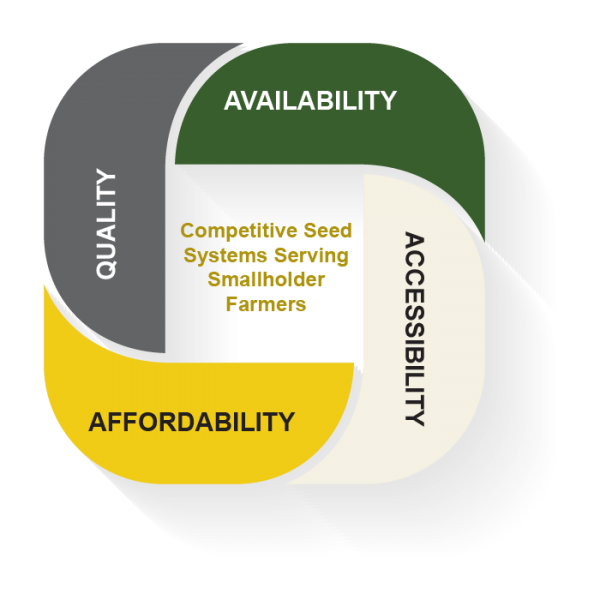 Accessibility: For seed to be accessible, sufficient delivery channels must be in place to reach smallholder farmers. Additionally, farmers need sufficient information on varieties and a sufficient number of outlets to make informed seed purchase choices. Affordability: At the final point of sale, each seed variety must be available at prices that are affordable for most smallholder farmers. This includes, among others, the availability of seed in small packages so that smallholder farmers can purchase seed at affordable prices. Quality: Seed must be available in quality that meets farmers’ expectations, labeled specifications or regulated standards. Further, to promote accountability, seed systems should have redress mechanisms available for farmers if the seed does not meet the stated performance. The African Seed Access Index (TASAI) is a tool that is designed to monitor and evaluate the structure, conduct, and performance of seed systems serving smallholder farmers in Africa. The intended outcome of TASAI is improved access to locally adapted, affordable, and high-quality seed of appropriate varieties by smallholder farmers in Sub-Saharan Africa. TASAI will be used by practitioners in the public sector, private sector, and development aid agencies to both inform and compel change. Public Sector: The primary audience for TASAI is public policy makers, regulators, and law enforcement agencies involved in the seed system value chain. Implementing institutions such as ministries of agriculture, seed inspection services, and agricultural research institutions can also use TASAI to benchmark their performance. Private Sector: TASAI can be used by seed companies and other value chain players to identify investment opportunities in the African seed value chain. Key stakeholders may also use this tool to potentially advocate for a better enabling environment. Development Aid Agencies: For NGOs and other development agencies working in rural agricultural development, TASAI can highlight issues that need to be addressed in order to ensure access to improved seed by smallholder farmers. TASAI can serve as a tool for donors to highlight critical areas within the seed value chain in which improvements and actions can be focused on. TASAI is a collaborative initiative between Cornell International Institute for Food and Agricultural Development and Market Matters Inc. Through this partnership, TASAI brings together research expertise from Cornell University with hands-on African agribusiness sector development work from Market Matters Inc. In-country partners will include local agricultural universities, seed traders’ associations, relevant government departments as well as non-governmental agencies working in seed sector development. Below is quick description of the key partners highlighting the expertise that they bring to TASAI. Market Matters Inc. (MM Inc.) is an independent, nonprofit organization working in the field of international development, primarily in Sub-Saharan Africa since 2003. The focus of MM Inc.’s activities has been capacity- and network-building. Under the former, MM Inc. has designed and facilitated small and large-scale business management training programs for African agribusiness SMEs. To date MM Inc. has trained over 1,200 businesses. In its network-building portfolio, MM Inc. has created and coordinated the Seeds of Development Program, a collective of 30 African-owned SME seed companies. Through its work with seed companies, MM Inc. has built expertise and amassed a significant wealth of information about the African seed sector and built relationships with important industry stakeholders. To accomplish its work, MM Inc. generates income from program fees and has also received support from many donor organizations including USAID, DFID, SIDA, the EU, FAO, UNIDO, the Gates Foundation, and individual governments. Cornell International Institute for Food, Agriculture, and Development (CIIFAD), with partners in Africa, Asia and Latin America, initiates and supports innovative programs that contribute to improved prospects for global food security, sustainable rural development and environmental conservation around the world. Established in 1990 at Cornell University in Ithaca, New York, CIIFAD engages diverse disciplines, actors and institutions to advance knowledge and practice for sustainable agricultural and rural development. CIIFAD mobilizes Cornell’s academic resources, enabling faculty and students to engage in innovative, multidisciplinary work contributing to sustainable agricultural and rural development. Most of CIIFAD’s work is carried out by faculty members and graduate students who contribute their time and effort to collaborative programs. CIIFAD endeavors not only to foster adaptive research that leads to innovative, practical solutions at the field level, but to ensure scaling up of proven strategies and for wider impact. The Emerging Markets Program at Cornell University is a stage for academics scholars and leading practitioners that encourages discussions and bridges the exchange of information and knowledge of emerging market economies. The EMP research projects seek to generate critical information to improve private strategies in emerging markets, and to inform public policy makers of the requirements for and design of an enabling environment that supports competitiveness. In this way, EMP contributes to the economic development of emerging economies by strengthening private strategies and public policies. The teaching courses in EMP disseminate knowledge and research findings of emerging market economies and to provide students with the skills needed to compete effectively in a global marketplace.